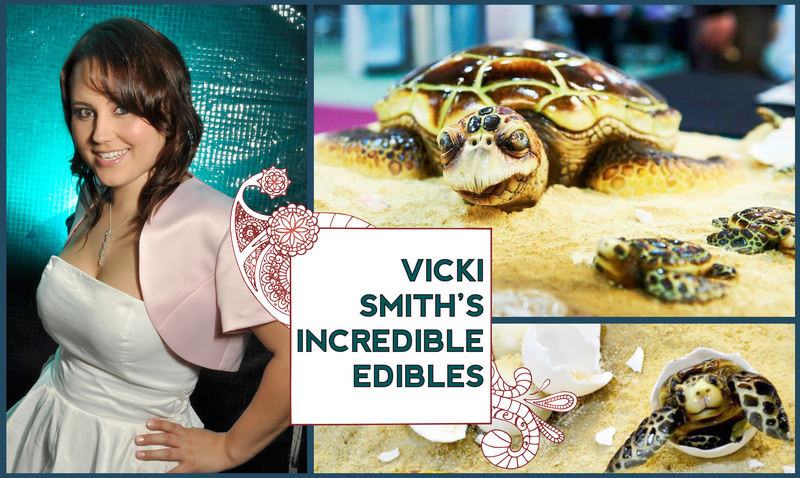 Vicki Smith is just 26, and has been making seriously outstanding cakes as Incredible Edibles for three years now. 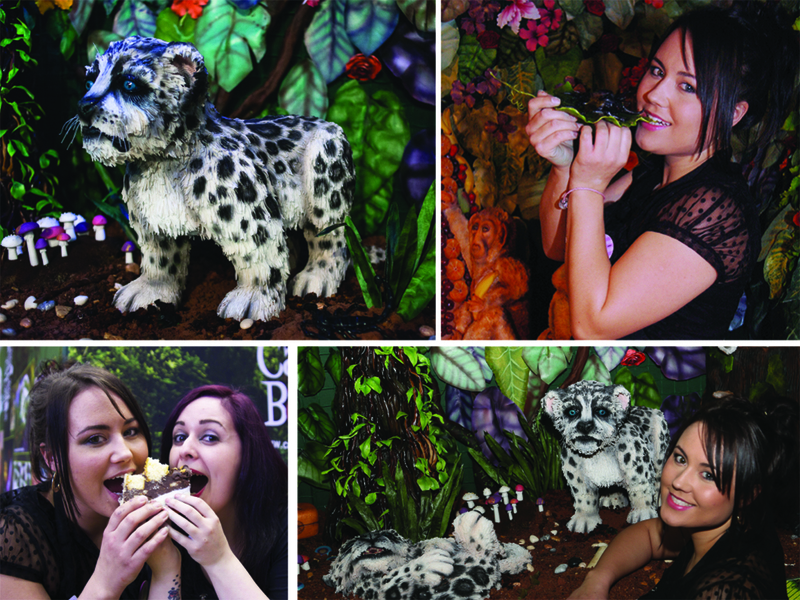 She produced some of the most eye-wateringly brilliant stuff in CakeBomb’s jungle, and she was prolific too. So many of the edible flowers you see around the walls were hers. Hi Vicki, tell us about yourself. I’m 26 and live in Flint, North Wales. I have an art background, experimenting with life drawing, photography, textiles, ceramics and digital media at college. I love painting, drawing and creating gifts for people that they couldn’t buy in the shops. I love to see people’s faces light up when you give them that gift. It’s the same with cakes … even more so when someone says they can’t cut my work 🙂 It’s edible … take a slice … I have to hide when they do it though! That’s the best thing though … that it’s edible works of art that I’m making. I’m looking at having a workshop in my back garden which my mum and dad are building at the minute. I wouldn’t be able to do any of this without my family. I love them very much. Did you like the jungle theme, did it give enough scope for creativity? The jungle was very challenging but fun at the same time. I got the chance to try things I’d never tried before. Like the challenge of making a standing animal cake, figuring out how to make the support frame. Everyone has their own style, with me is creating realism and everyone always comments on the eyes and mouths on my work. I’m a big fan of the edible glazes. I either use PME or shell and shine. A standing leopard cub cake was definitely a challenge for me but something I’d wanted to try for ages so it gave me the opportunity. I had the help of my dad and tried to get involved where I could. My main concern was getting the effect of the underbelly but getting it to stick. On top of the board was all cake. Even the head was on its own shelf support and was cake, with the front snout being Rice Krispie treats. It took around 70 hours to make both cubs. Texturing the fur inside and around the legs was very time consuming. They had amazing blue eyes – how did you make those? The blue eyes were fondant on sticks, which were then dipped into hot isomalt to create layers. I’d paint each layer,building up the depth. I added some Dinkydoodle iridescent blue colour to add a reflective glowing shine to the eyes. It’s hard to get eyes the right size as the more layers you build up the bigger they go. Then the danger is they become too big and cartoon like. I had to make a few pairs of eyes before I got ones that I liked! The cubs were a really popular feature of the jungle, especially with the kids. You seem to have a knack for choosing a popular theme and executing it perfectly. Your award-winning “Oleg” cake was a good example of that. Who or what are your influences for your cake ideas? I go for things I like. I try to go for cute things that will make people’s hearts melt. Also I take notice of things that are getting popular. Oleg is a really cute character and he’s also quite a new one on the Compare the Market/Meerkat ads. Those Oleg toys have really caught on – people seem to be selling their Oleg toys online to make profit as he’s such a wanted character. But mainly I just like him! My other hobby is keeping a marine coral reef and that is a big passion of mine. So I sometimes go down the fishy route as it’s something I’ll really enjoy doing. Duff Goldman is one of my biggest influences. He makes things you would think are impossible out of cake. He makes cakes move and smoke. I’d love to make a moving cake. I’d love to do a collaboration with him in the future on a big project. His elephant and life-size car were amazing, and to top it he’s such a lovely down-to-earth guy. You made some incredibly lifelike flowers and leaves for the jungle – what kind were they? What did you make them from?I made some large hibiscus flowers from wired flower paste and stamen centres dusted. I made some hibiscus wired leaf branches also from sugarpaste, and leaves from rice paper. And lets not forget one of the most stunning elements in the jungle was the beautiful free-standing frangipani bush that you made. What was that made from? The frangipani tree turned out fabulous. I’d never made one before. I knew in my head how I wanted it to look but seeing it when it came together was mind blowing. Even I didn’t know how it was going to fully turn out. The branch itself was plumbing piping and connectors that was covered in rice Krispie treats and melted dark chocolate. The leaves were wired rice paper that was airbrushed and veined with a home-made mould. The flowers were made as individual petals wired together. I’d dusted with edible flower scents but the strongest luxurious chocolate smell took over. Your work didn’t stop each day when the show ended – you were making handmade moulds while staying in Manchester for the show to decorate the elephant, weren’t you? Are you drawing on your ceramics background here? Yes, I’m into the mould making now. Anything to make it easier. My task for the elephant after spending a day underneath her, spraying the grey, was to work on the headdress. I wanted to make gold coins to decorate it with. And I knew we would need a lot. I’d taken my silicon mould kit to the apartment where we were staying and late at night I made some embellished coins from sugarpaste. As tools I used things I collected from round the house … bottle tops, pen lids, forks etc. I let the coins dry and quickly moulded them in the morning. I took these to the show and knocked out a load of coins! I then sprayed these gold and glued them onto the headdress, piping chocolate fudge to make it look like they were sewn on. I also blinged up the feathers made by Rose, Francesca and Dawn and placed them on the head of the elephant. Because I was in full-time employment, getting everything done was my biggest challenge. I was working solidly up until the show and even then going home and working through till 3 am to get the frangipani tree done. I had my mum and dad wiring leaves the day before. You made some really brilliant insects. What did you make these from? Did their size and fragility pose any problems? What did you get out of the project? I’ve made some lovely new friends and hopefully it will link me to future clients and work. I’ve got big ideas for the next Cake International shows so watch this space! 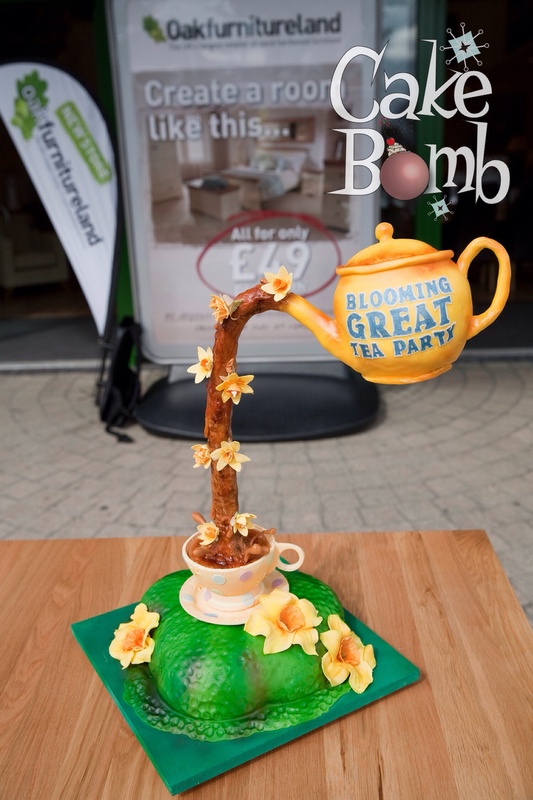 To celebrate the opening of Oak Furniture Land’s new store in Croydon, CakeBomb commissioned Jacqui Kelly of Totally Sugar based in Wimbledon to make a gravity defying teapot cake. 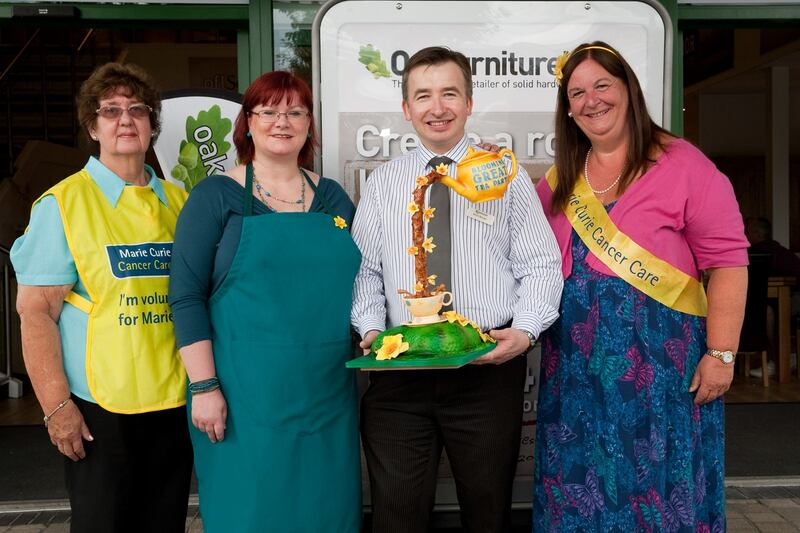 This fab cake, featuring a big yellow teapot made of ginger cake and incorporating the trademark Marie Curie Cancer Care Daffodil was presented to Marie Curie Cancer Care, South East on Saturday. It was cut up and given out to Marie Curie volunteers and supporters at the Gift for the Future event at Brooklands Museum on Tuesday. 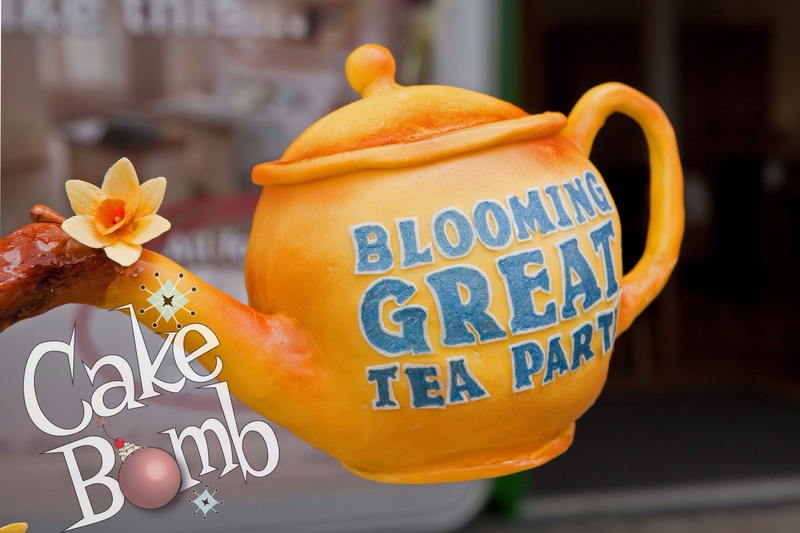 Last week was Marie Curie Cancer Care’s Blooming Great Tea Party week, where fundraisers hosted tea parties with cakes, games and raffles etc in their own homes, workplaces or community centres to raise money for the charity. If you missed it, don’t worry, there are other ways to raise money for Marie Curie Cancer Care. Here are some ideas here. Great job, Jacqui, I’m in the mood for a good strong cup of tea and a slice of cake now. (Aren’t I always though). Poet John Clare was born in Helpston near Peterborough. He’s sometimes known as the peasant poet, because he was a farm labourer with only a few years of formal education. This year, Peterborough is commemorating the 150 years since the poet’s death (1793-1864). Study of his work was neglected for many years but he is now considered one of the most important 19th century poets. The largest collection of his manuscripts can be found at Peterborough Museum and Art Gallery. 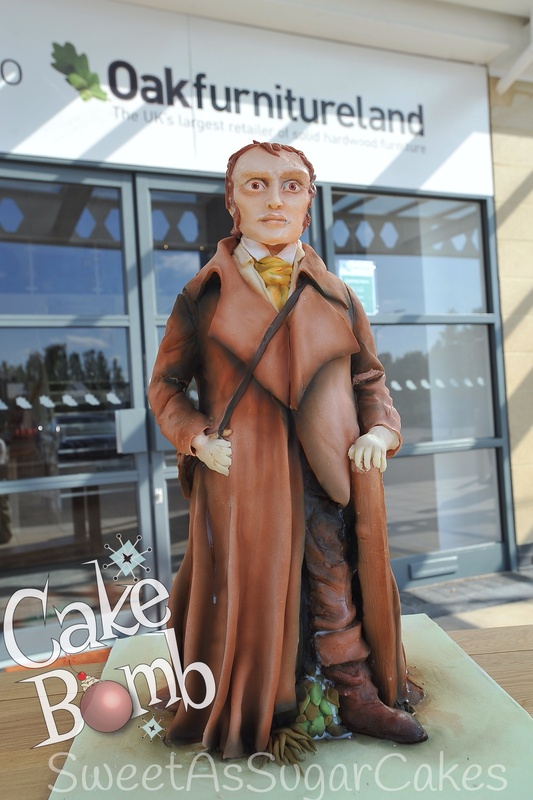 For the opening of their new store in Peterborough, Oak Furniture Land again commissioned CakeBomb to create a memorable cake, fitting for the area, and Laura Miller of Sweet As Sugar Cakes has done more than that with her incredible cake portrait of John Clare. For Welcome to the Jungle we were very privileged to have the input of award-winning sculptors Masters and Munn – that’s André Masters and CJ Munn. They loaned us some casts of elephant skin and gharial skin and our showstopping elephants poos were thanks to them too. André’s background is in modelmaking for film and television including sets, armour, props and animatronics. André works in all kinds of media and takes commissions for, amongst other things, interior design and wearable art. CJ is a self-taught artist from Kent, the daughter of artist Diane Brazier and film maker David Brazier. She originally worked as a writer and producer for television. After the birth of her son, CJ jumped at the chance to change career, rapidly becoming the award-winning “lifecaster” and sculptor that she is today. Masters and Munn’s Endangered Species Collection, is where they and CakeBomb meet (through Francesca Pitcher). CJ and André, your Endangered Species Collection, creates tactile works of art and teaching aids for blind and partially sighted audiences. How did you come up with this idea? 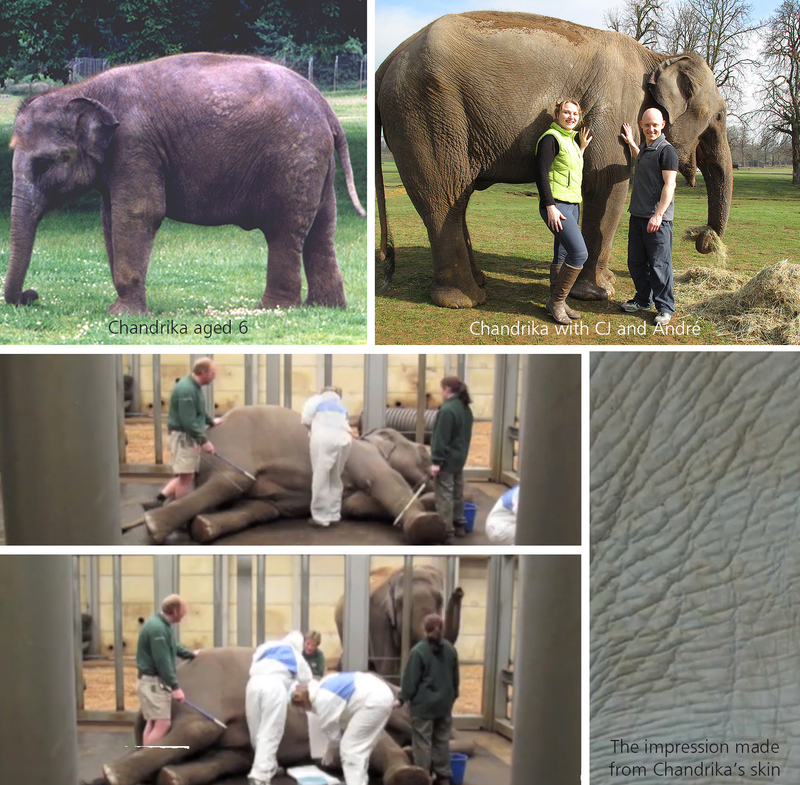 CJ: The original Endangered Species project actually began in 1998 when André cast a six year old Indian elephant at Woburn zoo called Chandrika (Indian translation, meaning “Moonlight”). AM: I was originally inspired to take the cast after overhearing a blind girl at the zoo asking her parents “How big is the elephant? What does it feel like?” and the seed for the project was planted in my mind. The project involved working with schools for the blind, creating high quality life casts of animals in order to make three-dimensional teaching aids that would be accessible and exciting to blind and partially sighted children, as well as other visitors to the zoos education centres. In order to compare size and texture, life casts of domestic cats and dogs were made to give ‘The Endangered Species’ a scale reference. I was originally inspired to take the cast after overhearing a blind girl at the zoo asking her parents “How big is the elephant? What does it feel like?” and the seed for the project was planted in my mind. The practicalities of getting these samples must have been considerable. Can you give me a couple of examples showing the difficulties involved. AM: Most of the casts were taken whilst the animals were being annually vetted. Once a year the animals are given a general MOT, they are all weighed, blood samples are taken, their teeth are checked and the female animals are given pregnancy tests to see if there might be any future arrivals in the zoo. Once the animals are anesthetised we only have a few minutes to make the moulds so the whole process needs to be planned and executed with pin point accuracy. Anaesthetising large animals is a tricky business which does involve some risk for anyone who enters the animal enclosure in case they wake up early. The bottom line is, you never really know what might happen so you have to be flexible in your approach in dealing with highly fluid working environments and always remain calm under pressure. 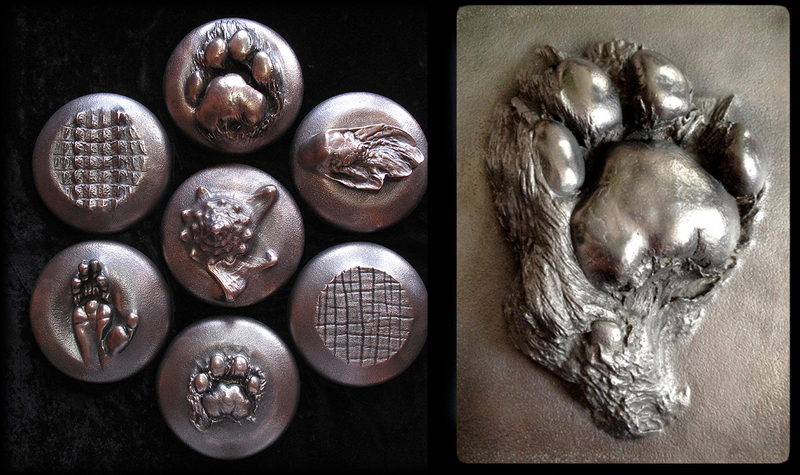 How do you prepare the surface of a real animal’s skin or paw to be moulded? AM/CJ: There are various techniques and materials we use which are both skin and fur friendly for the animals. All of the products we use are based on natural ingredients which are researched, tried and tested for suitability and ease of use for us and for the animals concerned. For hairier animals a barrier or release cream of some sort is always used so as to avoid giving the animal any sort of ‘waxing’ experience. That way, by the time they wake up, they won’t even have been aware we’ve cast them at all. What have the audience’s reactions been like? AM: The project’s impact and ultimate success was fully realised the first time the casts were shared with children from The Leatherhead School for the Blind, exploring the texture and size with their fingers and then holding the dinner plate-sized paw cast of a Sumatran Tiger. When their faces lit up with the delighted realisation of the enormous scale of this powerful creature (that just simply hadn’t come across from verbal description alone) it opened up a whole new world of wonder about wild animals. Do you think Chandrika remembered you from your first meeting? AM: Chandrika definitely remembered me. I was filming our reunion with my camera and nervously laughed as she ran towards me like an excited puppy. She wrapped her trunk around my waist and cuddled me before raising her trunk over my head which is elephant body language for ‘Look how tall I am!’. It was wonderful that she did remember our original meeting and that we could continue working together, creating beautiful casts that would continue to educate and provide a life like point of reference for future generations. She was one of the only animals from which you made casts to not be anaesthetised. Did you at any point worry that she might decide ‘enough’s enough’ and squash you? CJ: André wasn’t at all nervous, having worked with elephants before, but I must admit I was a bit worried beforehand. I’ve worked with horses in the past who can be skittish and kick on occasion and I do remember saying to friends ‘This could be a very embarrassing way to die!’ before we went. But once I’d been introduced to Chandrika and the other elephants at Woburn I felt so safe with them. Despite their enormous size, they are in fact extremely agile on their feet, always watchful and careful not to step on us, bump into or push us around. They were also very playful, using their trunks to sniff around our pockets, checking for treats and generally being quite mischievous. But discovering just how intelligent and sensitive they are also reassured me. Chandrika, like many elephants living in captivity, understands about as much as a human toddler and we could ask her questions to which she would either nod or shake her head in reply. In this way I felt reassured we had her permission to cast her, especially as the ‘payment’ was a bucket of fresh apples which she didn’t have to share with the other elephants. She was so cooperative and patient with the process – much more so than many of the children we get coming to the lifecasting studio! Chandrika definitely remembered me. I was filming our reunion with my camera and nervously laughed as she ran towards me like an excited puppy. She wrapped her trunk around my waist and cuddled me before raising her trunk over my head which is elephant body language for ‘Look how tall I am!’. Here is the video of Masters and Munn casting Chandrika. In what other ways have you added to the collection recently? AM: Since the early days ‘The Endangered Species’ collection of unique and precious casts have grown to include casts from Chessington World of Adventure, Maidstone Museum, return visits to Woburn to recast Chandrika as a fully grown 3,300kg adult elephant and working with the WWF, making seven bronze casts for their brand new head office and ‘Living Planet Centre’ based in Woking, Surrey. As macabre as it might sound, we’ve also gained a bit of a reputation for casting recently deceased animals, so if anyone we know finds anything unusual we’ll get a call or an email from someone asking us if they should pop it in their freezer till we see them. Some people might find that a bit gruesome, but living specimens of wildlife are not always readily available and a dead lizard or weasel is always going to be slightly easier to cast than trying to track down a live one that just happens to be being anaesthetised for something. We’d certainly never anaesthetise an animal just to cast them, or anything else that could put the animals at risk. How did you meet Francesca? AM/CJ: Originally CJ met Francesca via the Maidstone Mums in Business group and then introduced her to André. As we began following Francesca’s Facebook page, she just published her amazingly realistic ‘snake cake’ and we began discussing and planning a variety of possible joint projects. You kindly loaned us moulds of a gharial crocodile, elephant hide and a mould of elephant dung. Was the gharial a live specimen? AM: I’m afraid not. The Gharial belongs to and was moulded at Maidstone Museum. As with all Museum specimens, the Gharial was a very old and rare taxidermy asset which we were able to mould for the WWF ‘Living Planet Centre’ project. What did you think of Annabel’s cake sculpture of the gharial, have you seen it? CJ: We haven’t seen it yet although we’re very excited to see the results and hear people’s feedback. We’re just waiting to see some of the photos of the exhibition, but heard it was a huge success. Annabel de Vetten’s gharial crocodile for CakeBomb. Annabel had Masters and Munn’s gharial skin mould as inspiration for the skin on her cake but she actually ended up carving the scales freehand to get the necessary depth of pattern in the sugarpaste she was using. What are the challenges involved with making a mould of dung? CJ: Well, dung moulding certainly isn’t something we make a habit of, but when Chandrika the elephant was producing so much of it, it occurred to me that someone, somewhere might want a bronze elephant poo doorstop one day. Funnily enough, I wasn’t wrong, as when we approached our local bronze foundry to ask for a quote on just that they told us ‘Oh we did a few of those last year, this year bronze cow pats are all the rage!’ Anyway, taking the initial mould of the poo in the elephant enclosure didn’t seem too problematic. There is a pong in any animal enclosure but you soon get used to it and forget about it. But having brought the poo-in-mould back to our home studio to demould and cast it out it was quite a different story. The smell was something completely other-worldly when taken out of context and into our home. The fumes practically burned my eyes! ;o) And to get the original poo out of the set mould so I could recast one in plaster has to be one of the most disgusting jobs I’ve ever done. I realised all too late that the only way of doing it was to reach in there with my (thankfully gloved) hand and pull out lumps of poop a chunk at a time. Lovely. Still, the mould has already proved very useful and we’ve made copies for education centres at zoos and safari parks and then of course Francesca’s fabulous edible poop! 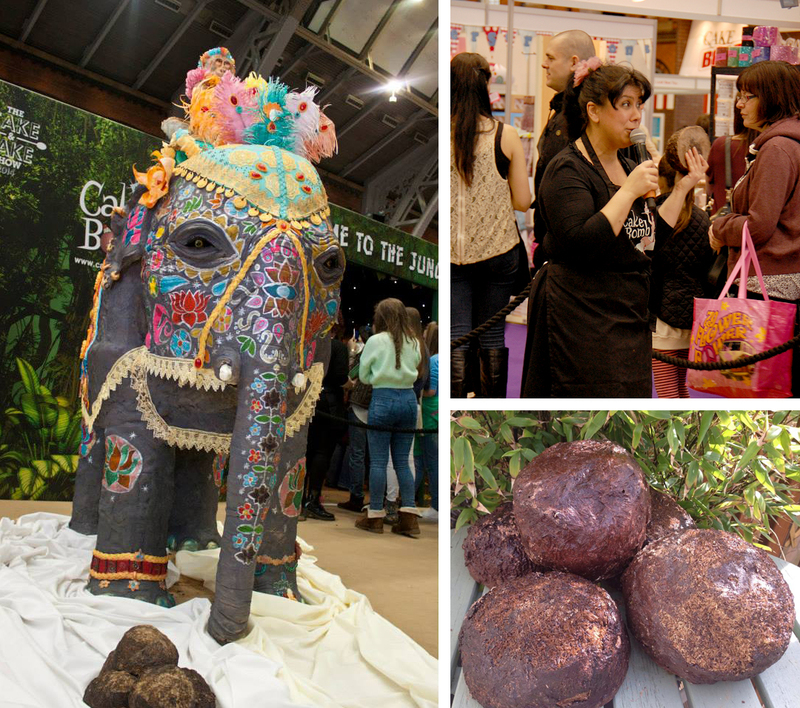 Would you eat a chocolate elephant poo? AM/CJ: Providing the mould was made from a food safe silicone that had been properly cleaned and the casting material was indeed, edible . . . we’d eat it! Do you think you might ever consider sculpting from edible materials? AM: Having worked on many promotional advertising food commercials as a model maker and prop master, I have had many opportunities to work with a large variety of food items and ingredients. As life casting artists, CJ and I have actually been working with food materials for more than ten years. We have cast sculptures out of chocolate, cake ingredients, ice, jelly and sugar syrup. In 2006 we made life-size figurative bread moulds of artist Sharon Baker for her ‘Eat Me’ exhibition at London’s Thames festival and last year I was featured on Pat Marsh’s BBC Radio Kent show as a food artist specialist. All in all, CJ and I love researching new material technologies and working with other creative artists and technicians as it keeps everything exciting and fresh for us. Seeing the audience rip apart what looked like a human corpse and devour it was very disturbing even though we knew it was essentially a giant loaf! CJ: Yes, helping make the bread bodies was a big favourite. Seeing the audience rip apart what looked like a human corpse and devour it was very disturbing even though we knew it was essentially a giant loaf! I’ve always wanted to do more large-scale chocolate pieces as I’m a bit of a chocaholic and grew up making my own Easter eggs with moulds my mother had bought. The strangest application of edible casting technology I heard of was a former colleague who passed around chocolate bum-holes at a posh dinner party! I think you can even buy boxes of them on the internet….although I wouldn’t expect there’s a huge demand. How did you both meet and then decide to work together? AM/CJ: We first met via a lifecasting forum on the Internet 11 years ago, and both felt creative sparks fly. At the time, André was a modelmaker working in the film and advertising industry and I had not long started my lifecasting company, Rockabelly Lifecasts. Sensing I shared his passion for creativity and learning, André took me under his wing in the early years of my career, mentoring me as well as being equally inspired by my ideas and enthusiasm and hiring me to assist him with various commercial jobs. Within a year, André’s teaching had paid off so much that I was actually able to also start hiring André for my own artistic projects and a great working partnership began. 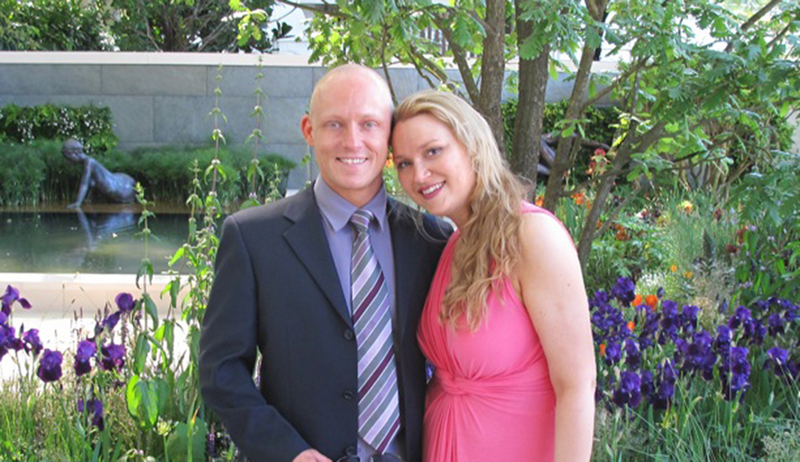 Over the years, friendship grew into romance and now we live together and share workshops in Maidstone, Kent. What are the challenges of lifecasting humans? AM/CJ: Every body part and every client comes with different challenges. For some body parts there are technical challenges, like working as fast as you can to capture a pose before your client feels any discomfort set in and working at such speeds to cover large areas before your materials set. The clock is always ticking. Then there are the psychological challenges. Most people that come to us either have to trust us with their naked bodies or a new baby or even a dying relative. That’s a lot of trust to gain from people in a very short space of time. So we try to be as open as we can with people about every stage of the process to well-prepare them for the experience. We’ve both been cast ourselves many, many times too, so we can talk people through exactly how it will feel at every stage, and thus avoid situations where people might feel nervous or surprised by the experience. Then there are age-related challenges like how to keep a wriggly toddler still for the 2 minute it might take to get a decent cast of their hand or foot! Let’s just say multi-tasking comes into play big time. We can both cast a foot whilst simultaneously singing Disney songs and feeding people chocolate biscuits. Whatever it takes to get a good cast and leave people with great memories really! AM/CJ: Our work can often be seen at the Fairfax Gallery in Tunbridge Wells and the Lilford Gallery in Canterbury. 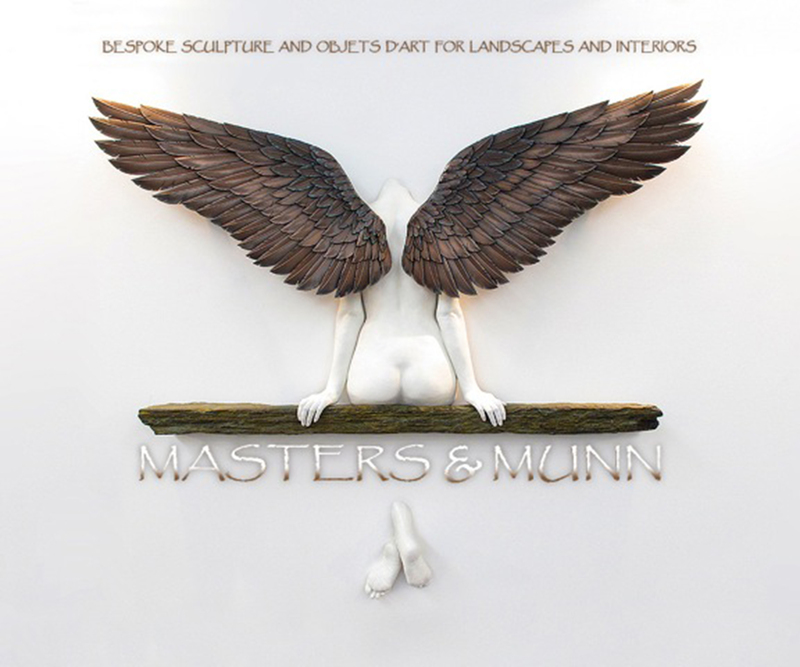 We have also exhibited at the Business Design Centre in London, the Carrousel Du Louvre in Paris, Godinton House in Kent, the Forge Gallery in Worthing and as members of the Surrey Sculpture Society, we will be exhibiting in many more venues in and around London so keep checking for updates on our website. Thanks for helping with Welcome to the Jungle! AM/CJ: Thank you for inviting us to be a part of such a fun and exciting project! No harm was caused to any animals in the making of the collection. Did you guess the species of orchid correctly? 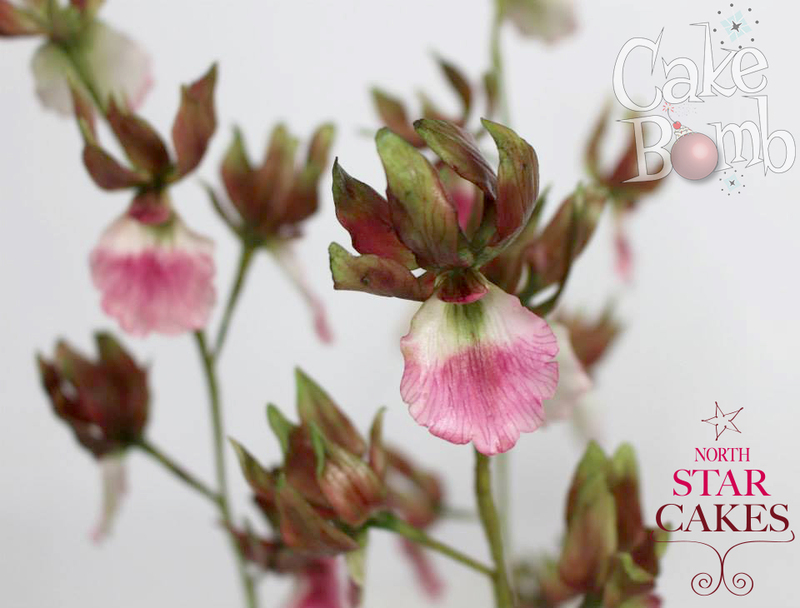 The name is Eulophia Guineensis. The winner who correctly identified the flower wins a signed copy of of Eric Lanlard’s book Chocolat. It will be announced over on our Facebook page. 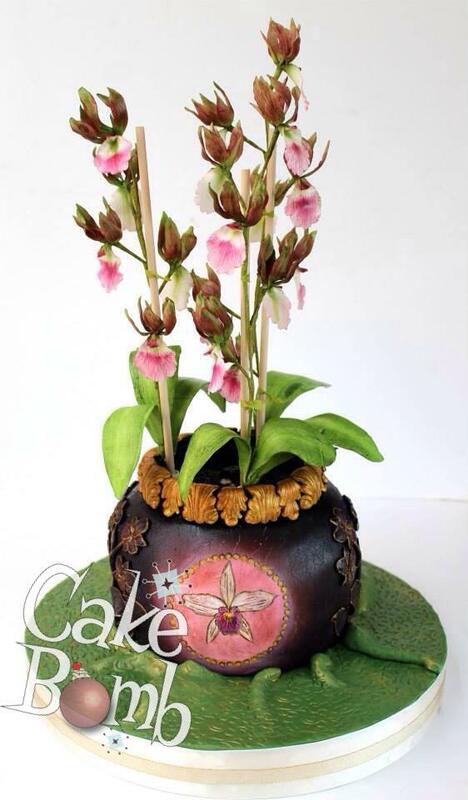 The jardinière cake is Francesca’s original art work based on elements from the Orchid Society of Great Britain‘s gold award winning display at the Chelsea Flower Show this year, which was sponsored by the Ministry of Tourism of the Sultanate of Oman. Eulophia guineensis is native flora of the Sultanate. 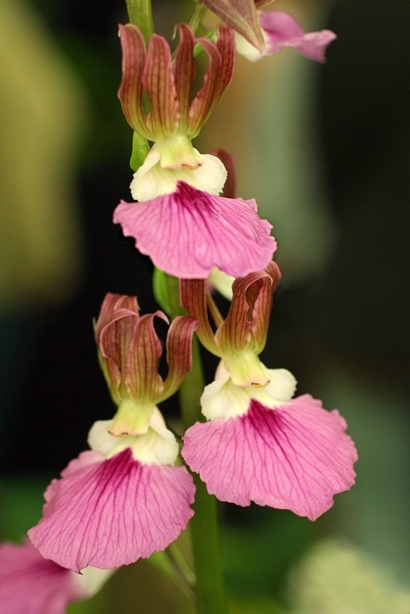 Also in the display was another impressive flower native to the Sultanate of Oman, a six foot tall Eulophia petersii. Hey it’s turning into Gardener’s World around here. The Orchid Society also won gold at Chelsea last year. 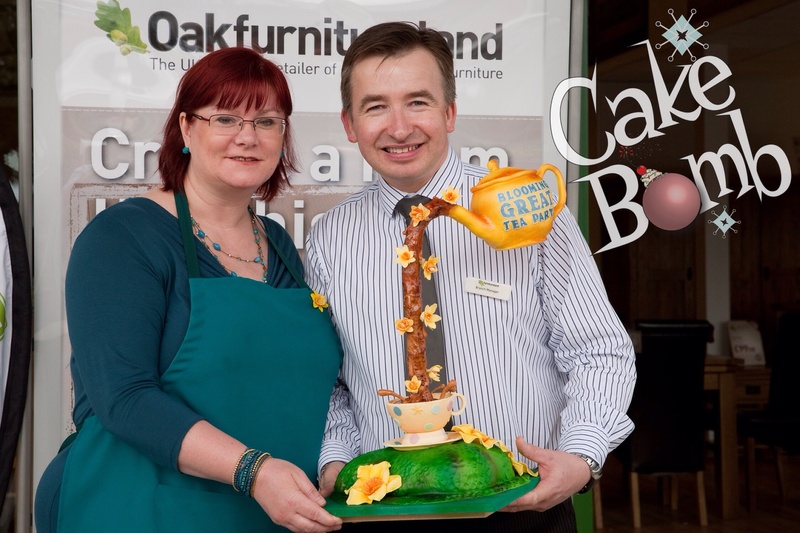 Our cake for the launch of the Oak Furniture Land Orpington branch was presented as a gift to the Orchid Society. 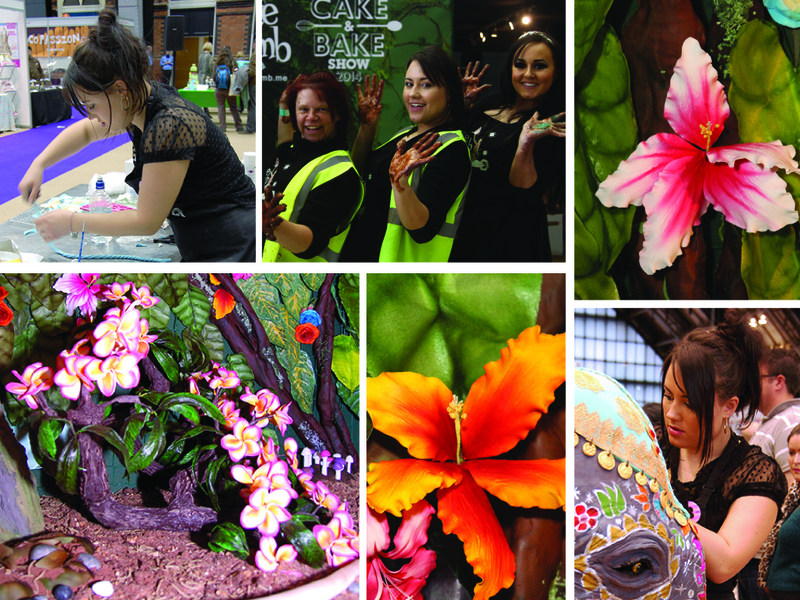 It is made of carved sponge cake covered with sugarpaste, and is hand painted in edible dusts with another of the flowers from the gold winning garden, Cattleya Purpurata. It is the handiwork of CakeBomber Francesca Pitcher of North Star Cakes. We think that the jardinière and the ‘planted’ orchids are very realistic. Great job Francesca! Well, you know what kind of blog this is by now. Of course we like flowers … but we’re CakeBomb! So these aren’t just flowers. They’re exquisite handcrafted orchids of a rare species. So, given that you’ve now been told they’re not real, three guesses as to what our flowers really are. China? Porcelain? Opaque glass? Nah … sugar of course! 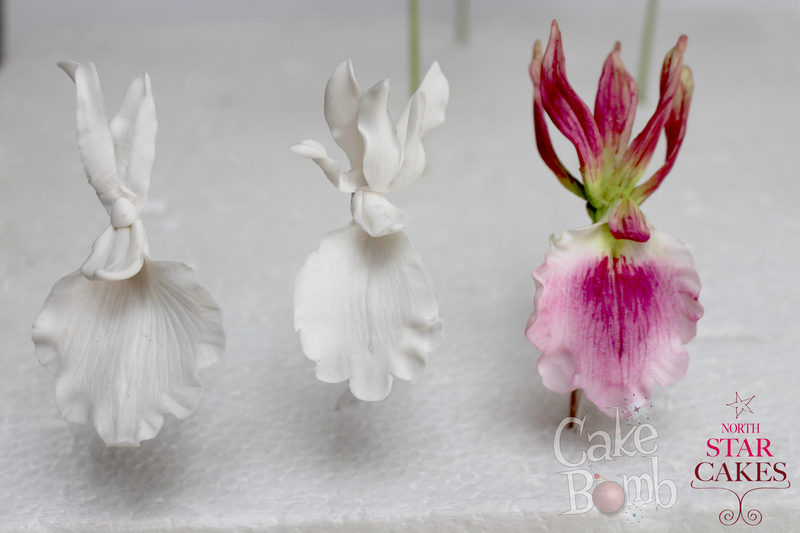 These rather special orchids are made from flower paste. We won’t reveal the species of orchid though – not yet. There is a competition still open on our Facebook page. 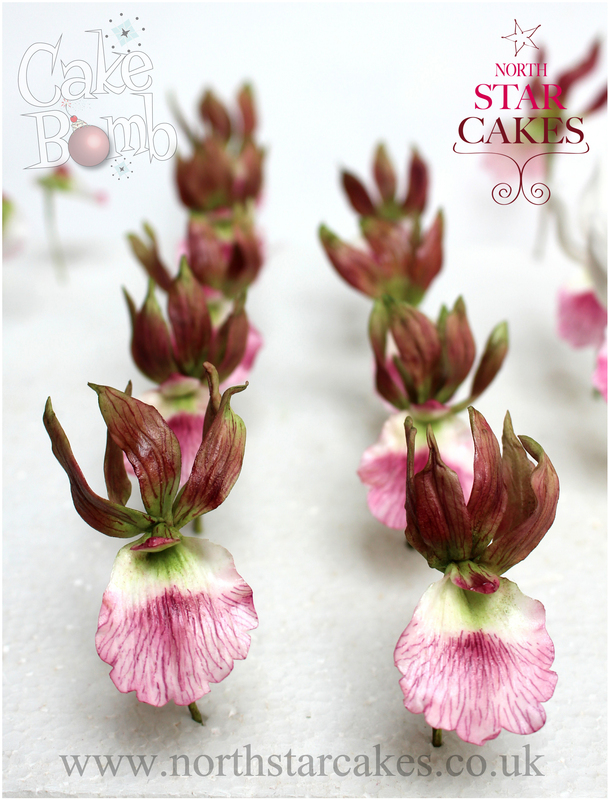 If you can guess the orchid species by June 15th you can win a signed copy of Eric Lanlard’s new book Chocolat. The finished cake will be revealed today in Orpington. Our cake artist this time is CakeBomber Francesca Pitcher of North Star Cakes. Oak Furniture Land commissioned us to create something special for the launch of their new store. The cake is being presented today to a member of the Orchid Society of Great Britain by the manager of the new store. Check out our competition over on Facebook. Closing date is Sunday June 15th.